Loving to stay warm inside of our house and finding simple things to play with. (Idea from Pinterest). The fun new fork and spoon I bought for the little man. All the little visitors that are coming to our backyard. Apple Cider season + using my fun mugs. Did I ever tell you I love mugs? I tend to buy a mug when I visit new places. 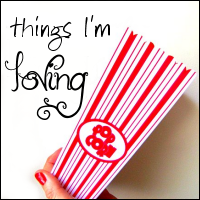 If want to join the "Things I'm Loving" fun, just click on the picture below.